That's two out of two for Godard so far. While I really enjoyed Breathless, Vivre Sa Vie has been the stand out for me. It is told in twelve chapters, as it follows young Nana (Anna Karina) and her descent into prostitution. Breathless was a film that was dripping with style, but Vivre Sa Vie had that one extra factor that made it more interesting to watch. First of all, I loved Anna Karina. She just oozed this air of style from the way her eyelashes batted about and her hair formed that spectacular bob on her head - basically, she was my idea of everything stylish from the 60s. Plus, that dancing scene of hers completely one me over. The story that she performed was devastating, though. Nana was such a sweet, quite naive girl who needed to make ends meet, which unfortunately turned her to doing something that extreme. However, Godard doesn't handle the prostitution as a way of making us feel only pity for Nana. We're drawn into her world, where we find out the ins and outs of the job, and how the people doing it interact with each other. Again, it is the documentary feel that Godard achieved with Breathless, and achieved with this one, too. Instead of making this an overly melodramatic film about a woman's sad descent into something she does out of desperation, it is basically a close up on what can happen to a person. A real person. Not a movie character. One of the things I loved the most about this film, though, was how philosophical it was. There was one particular chapter towards the end which had Nana talking to an old man at a restaurant. I can't really explain how wonderful this scene is - just the words thrown back and forth are so beautiful, so meaningful, and so interesting. In fact, I really want to get a transcript of this conversation to read every single day for the rest of my life, just to remind me of the little things I always forget. And at least six times a year I want to revisit this film to remind me of everything else that I always forget. It's that amazing. Now, I feel a little weird writing about Au Hasard Balthazar, since I had this especially bizarre dream about it last night. It was one of those dreams which I don't remember at length, but all day I've had the donkey, Balthazar, haunting my brain. Which is strange because Au Hasard Balthazar isn't the kind of film that I though would be capable of making me look at donkeys in a different, darker way. 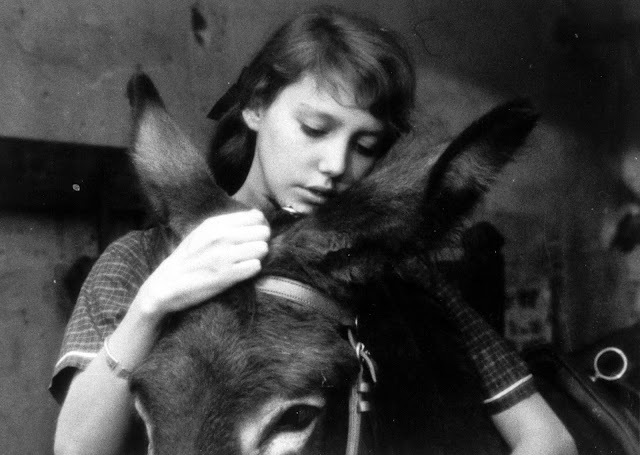 In fact, it is just a really lovely, but of course very tragic, film about a donkey and his times and trials in life. He starts off life surrounded by happy little kids, only to descend into a life filled with hard work and abuse from the people around him. If you've been around this space on the web for a while you'll know that I have a huge tendency to love any film that has a cute animal in it, and this one is no exception. However, what this film has above some other animal movies is that through the eyes of this donkey, we see what the world is. We see how cruel people can be. We see how unfair everything is. We see how a life can be lived, day by day, with everything and everyone changing around it. Perhaps that's why the dream that I had last night was so unsettling - Balthazar, the poor, innocent donkey that he was, was really a symbolism for the world. I honestly can't say that I loved this film, but I definitely appreciated it for what it represented. Especially because it managed to be such an effective outlook on life even though it wasn't told from the point of view of a human. And that's something very magical, indeed. What do you think of these films? What is it about donkeys? I haven't seen Au Hasard Balthazar, but I have a book which I cherish called The Silver Donkey, where a young british soldier who has run away from the war (set in WWI or II), and is found by two young french girls when he is blind in the woods. He tells them different stories, all featuring a donkey. It makes me cry, it's so sweet, but sad! Vivre sa vie is my favourite Godard film (though I've only seen three of them). Glad you loved it, Anna Karina is so beautiful! I guess donkeys just make for interesting characters! Anna Karina is so beautiful! Wow. Glad you liked Vivre sa Vie. You'd be surprised how many of Godard's films are about prostitution. Quite a few. This is my favourite, closely followed by 2 or 3 Things I Know About Her. But yeah, Vivre sa Vie is awesome. I might catch up with those ones afterwards, especially Mouchette, which I've heard a lot of good things about. I love Vivre Sa Vie. Anna Karina is so beautiful in it and I love her dancing and her talking and her face in the cinema hall and that ending. It is a very interesting view into the world of prostitution and it is my second favourite Godard. Though I really should be rewatching these. It has been quite a while. Haven't seen Balthazar but Pickpocket was pretty neat. I've heard quite a bit about Pickpocket - will definitely check it out when I can. I just started watching French New Wave last year and the first one I saw was Vivre Sa Vie. I ran across it randomly and ended up loving it. For some reason I felt as if I wanted to help Karina fins a way to better herself. Even though I found this movie to be something that I can't personally identify, I felt extreme sadness for her. I haven't seen "Balthazar", but I will certainly keep my eyes open. Thanks for the reviews. Two great films. Vivre Sa Vie is my unofficial favourite Godard film (I think) but it changes pretty often. I have been shifting between Breathless, Bande A Part and Masculine Feminine too. Balthazar is tough going, but it is a very important film, I think. Bresson is a master. Have you seen Pickpocket or A Man Escaped? You should watch them too. I loved Vivre Sa Vie more than Breathless, so it is my unofficial favourite Godard film, too. I'm going to check out those ones some day soon, I've been told that they're very good! Vivre Sa Vie is my favorite Godard film, so I completely understand that you liked it more than Breathless. Anna Karina is just, well... breathtaking in that movie. Love it. I need to rewatch Balthazar before giving a legit opinion on it. But either way, glad you're having fun exploring the French New Wave! Anna Karina is breathtaking in Vivre Sa Vie. I loved her in it. And this French New Wave thing is quite fun! Balthazar is a particular kind of film that I don't think will move everyone as much as it moved me, but I'm glad you were able to see how Bresson allows us to examine the world through a different place through his techniques. And Vivre sa Vie is magnificent throughout. I love, love, love that philosophical conversation near the end. I think it makes the conclusion all the more moving. Both of these films are two of my favorites and two of the most moving films I've ever seen. Glad you sought them out and enjoyed them! Glad you enjoyed them a lot too. That philosophical conversation near the end of Vivre Sa Vie was something VERY special!